Less than a month after my first practice run to visit my family and to test the effectiveness of my systems and my plan, I was able to set off on my first real motorcycle road trip. It was April of 2009. I had been retired for all of four months. As it happened, a friend and former colleague at CNN, whom I hadn’t seen in nearly four years, was headed my way from Ohio. I had stayed in contact with Bryan Cady through his page on the social website, Facebook. And it was, in fact, he who had originally planted in my psyche the seed of motorcycling as an achievable and adventurous undertaking. 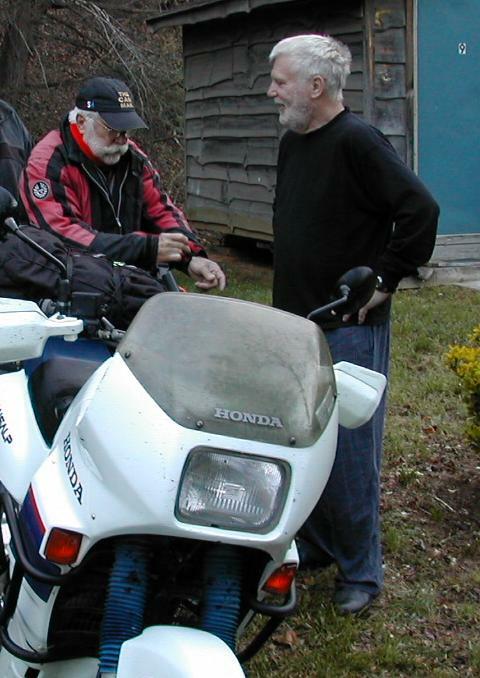 Bryan is a veteran biker, despite being decades younger than I am, but he was never one to proselytize for the pastime; he simply spoke fondly and with passion of his trips to fascinating places. He and his single-cylinder bit of German engineering genius have scaled Pikes Peak and suffered the inferno of Death Valley. They’ve slept under the towering buttes of the west and on the shores of Fundy. Bryan rode each of the 50,000 miles recorded on his BMW’s odometer, and he is at home on his Beemer in the same way that I am in my Lazy Boy. I was honored by Bryan’s invitation to join him– and other BMW “thumper jockeys”– at a gathering of the faithful in the mountains of North Carolina. I should make it clear, though, that Bryan and I had been discussing this ride for some weeks. And it was he who insisted that I get the experience of at least one solo trip before joining other cyclists on the road. The lessons and distractions of that first endeavor proved the wisdom of his guidance. Originally, Bryan and I had planned to link up in Knoxville– just about equally distanced from my home in Georgia and his in Ohio. 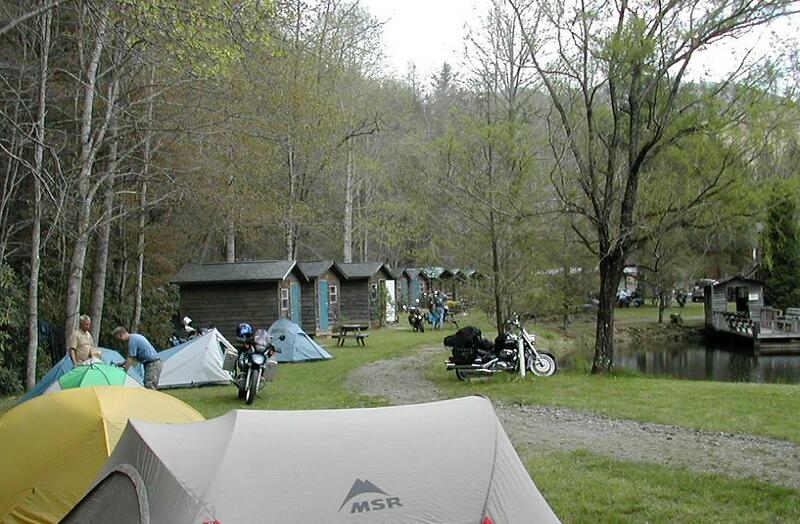 We were going to meet at a campground, spend the night, and then he could lead me through the early curves and turns of the Great Smoky Mountains. Well, The Weather Channel had other ideas. It rained heavily and consistently for days before and right on through our planned date to depart for Knoxville. In order to make his rendezvous with his sport bike friends, Bryan had to leave Ohio in the rain and make fast tracks for the meeting. I had no intention of riding in the rain– especially not into mountains for the first time. We agreed that I would come to the rally on its second day… after the rain had stopped. That turned out to be a good plan. It gave Bryan a day and a half of free time with his biker buddies without having to play host to the new guy. 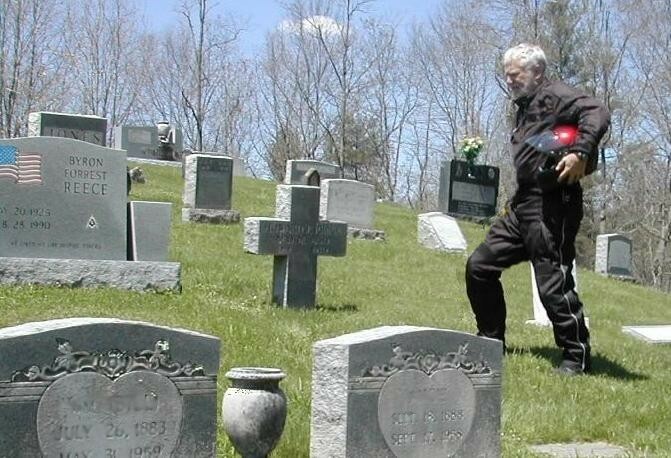 And it gave me an opportuinty to approach the North Carolina rally at my own pace in glorious spring weather and by a route that took me past my father’s hometown and his burial site. I don’t know what my dad might have thought of this post-retirement facination of mine. He’s been dead for more than half of my life. He never knew of my career achievements or my sailing across the Atlantic. He wasn’t one, himself, to pursue pointless avocations. A career military officer, he tended to focus on the immediate objective. But I rode my Black Beauty to the rural mountainside where we had laid him to rest so long ago, and I told him of the major events in my life… and how just getting there had been one of them, on coiled and curling roads that groped for altitude as they climbed steeply out of Georgia and toward the Blue Ridge. No cars or RVs allowed. 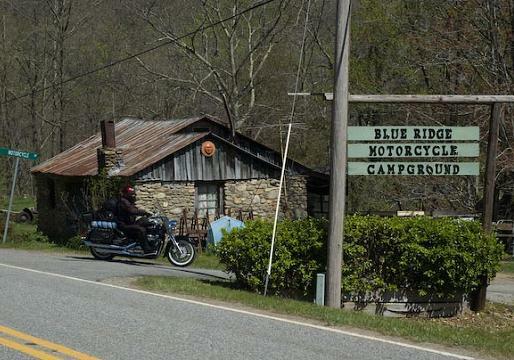 I camped not far from the cemetery, near Rosman, NC, and the following day I hooked up with Bryan at the quite hospitable Blue Ridge Motorcycle Campground in Cruso. Bryan’s group made me feel welcome and comfortable. Yet I wondered why none of them commented on my status as a nearly ancient member of the biking community. The next day I discovered the reason for their indifference. I had expected– at age 67– to be remarked as the oldest rider in camp. That was before I was introduced to Ike Maxwell. Ike was a hearty and fit 79 years old on that April morning in 2009. 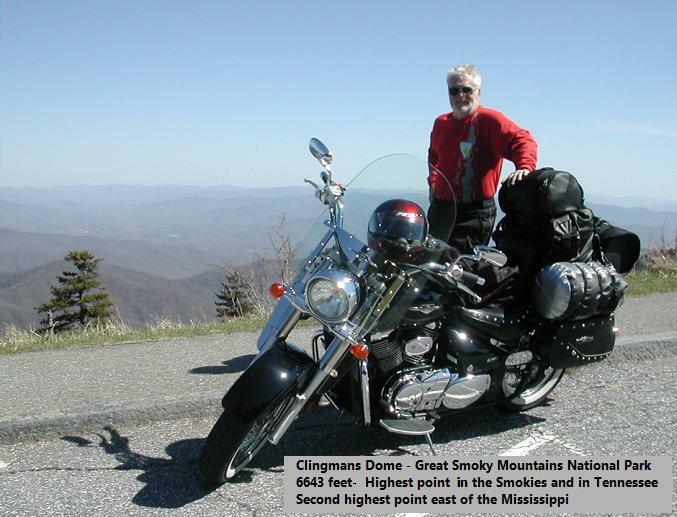 And he had plans in the next few months to celebrate his 80th birthday by riding his Honda sport bike across the country (east to west) on U.S. Route 80, and back again (west to east) on Interstate 80… Georgia to California to New York. Just getting to the rendezvous campground had been an almost terrifying learning adventure for me. Because of our change in schedule and my failure to meet up with Bryan in Knoxville, I had missed out on the early guidance and training I had expected to get from him. Forced to ride solo, each new curve and twist and switchback offered its own lesson in downshifting, throttle control, clutch manipulation, and the ever precarious effort to balance a heavily loaded bike. And that added up to hundreds of lessons in my two days alone. But there was an upside: I now had little trouble keeping up with Bryan when the BMW rally was over and we struck out on our Smoky Mountains tour. Not that he ever really put me to the test. But when he suggested I take the lead for awhile, I felt an undeniable surge of pride and satisfaction. Take me home, Mountain Highway. 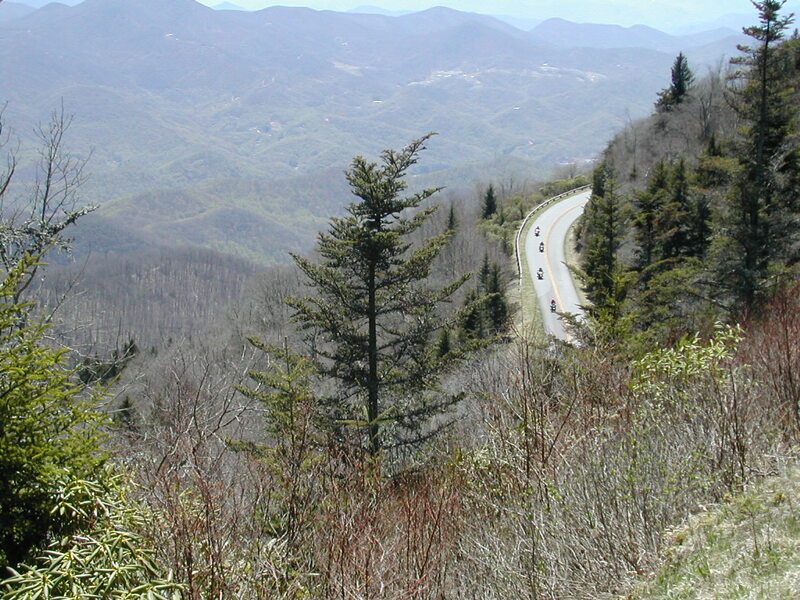 We headed back the way we had planned to come– along the Blue Ridge Parkway and back toward Knoxville, eventually passing through Cherokee and Pigeon Forge. We took a winding side trip to the highest point in the Smokies, and we camped along cold and clear streams of rushing mountain water. I had finally joined the legions of men and women who take to the road for renewal and release, and I was sharing in those rewards. Ah, it was good to run across your blog today, Paul. Last time I saw you was at the O Club in Vicenza, Italy. You and Roberta Farber-Reece had just split up and I was so sad. I saw her a few times after that, then lost touch. Have to admit – I would google each of you – now and then – over the years – just interested in what you were doing. Gave up on her long ago – figured she may have another name by then. But knowing your history as a TV journalist and sports enthusiast, I figured your name would pop up somewhere – sometime. Actually was searching for something else today and ran across info on a documentary you did about the Middle East – then found this blog. Read several posts – especially liked this one since you were wandering around in my mountains (very popular with bikers). I went on a memorable sailing trip with you all one time – visited you in Italy a few times. Thought of you both last year when I was in Scotland and passed by Lockerbie – bringing to mind the plane crash that happened as you and R were traveling to Germany to spend Christmas with me. Thought about you all again at Christmas on a big anniversary of same crash. Just signed up for your blog and look forward to reading more of it. I didn’t know you were a Smoky Mountain girl. My dad was born and is buried in Rosman, N.C., and since taking up biking, I’ve learned the Smokies and The Blue Ridge Parkway quite well.